Real, Natural Feathers, Certified Pure and Clean by the U.S. Government. NO Hazardous viruses, including Bird Flu. NO Diseases. NO Bugs. NO Insects, Larva or Eggs. 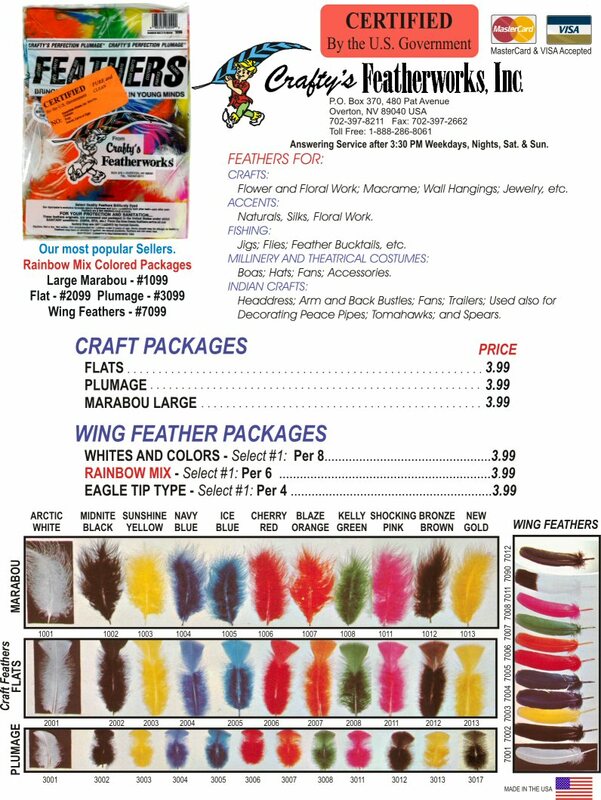 Crafty's FeatherWorks®, Inc. supplies Certified Feathers  for Crafts, Costumes, Fly Tying, etc. All Crafty's® feathers are gathered, processed, and packaged entirely in the United States of America. All of our plants and processing is done under U.S. Environmental, Product Safety, Worker Safety, and Worker Wage and Hour Laws. Call us for more information on wholesale or retail sales. Web page design, text and photos Copyright© 2008 by Crafty's FeatherWorks®, Inc., Overton, NV.